For children 2 years of age and older, chew 1 tablet daily under adult supervision. Chew tablet thoroughly before swallowing. For children under 2 years of age, consult a healthcare professional before use. Can be taken every day. If taking any medications, consult a healthcare professional before use. Not for use in premature infants. Keep out of reach of children. Take 1 capsule daily. May be taken at any time, with or without food. Keep refrigerated to maintain maximum potency. Plant-derived capsule (hypromellose, gellan gum), microcrystalline cellulose, magnesium stearate, silicon dioxide. Recommendation: Take 1 capsule daily. May be taken any time, with or without food. Keep refrigerated to maintain maximum potency. Microcrystalline cellulose, plant-derived capsule (hypromellose, gellan gum), magnesium stearate, silicon dioxide. Potato starch, plant-derived capsule (hypromellose), hypromellose, magnesium stearate, ethylcellulose, sodium alginate, silica, medium chain triglycerides, ascorbic acid, oleic acid, stearic acid. Plant-derived capsule (hypromellose), potato starch, hypromellose, magnesium stearate, ethylcellulose, sodium alginate, silicon dioxide, medium chain triglycerides, ascorbic acid, oleic acid, stearic acid. Recommendation: Take 1 capsule daily. May be taken at any time, with or without food. Keep refrigerated to maintain maximum potency. 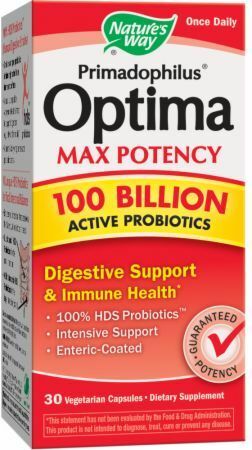 Primadophilus Optima Max Potency contains 100% HDS Probiotics (human digestive strains). HDS Probiotics are probiotic strains that were originally isolated from the natural human intestinal microbiota as opposed to being isolated from animals, plants, dairy or soil sources. Today these strains are grown and fermented in a controlled environment by some of the most respected probiotic producers in the world.